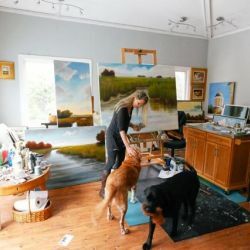 Laura Lloyd Fontaine lives in Charleston, SC and is recognized for her large, impressionist landscapes of the low country. She refers to it as contemporary impressionism with a traditional flair. Her process of creating a painting is unique to most artist. She prepares her canvas with a foundation of Venetian Plaster, which is ground marble. She has many years of working with plaster in her earlier years when she worked with faux finishes. The technique of painting on plaster with many layers of glazes gives her paintings its beautiful glow. Laura finds that working on a textured surface, she is able to layer color to create the depth of atmosphere. In 2015, Laura was chosen as the Featured Artist of Kiawah's renown magazine, Kiawah Island Legends. In 2018, Laura was commissioned to paint Drayton Hall, one of Charlestons most beautiful plantations. The painting will be auctioned off in the Spring of 2019 to raise money for the Preservation Trust. She was deeply honor finding out that she is the first artist to be chosen to paint and sketch the beautiful historical home since the 1800s. Laura graduated with a Bachelor of Arts Degree in Studio Art and a minor in Art History at Hollins College in Roanoke, VA. She continued her studies at the Philadelphia College of Art. Laura studied faux finishes in Great Neck, NY at the Finishing school, the masters of professional painted finishes. Laura has taken many workshops from artists and has enjoyed traveling and learning from all of them.